Today on Ananya Tales we feature Ritabrata from London. She flaunts her different types of skirts for various occasions. In her words- My love for types of skirts have been nonnegotiable. Since I was a little girl I liked this piece of clothing as to me it held a certain amount of mystery. Women wearing little pencil skirts hurrying down the subway, flowing long skirts reminding one of the bygone era and romantic fantasies, mini skirts and so on and so forth..yes I had gathered them all slowly in my closet. I particularly love this silk chic blue skirt which can double up as a dress. The maroon pleated skirt and the blue striped skirt can work well both for brunch parties and casual outing. 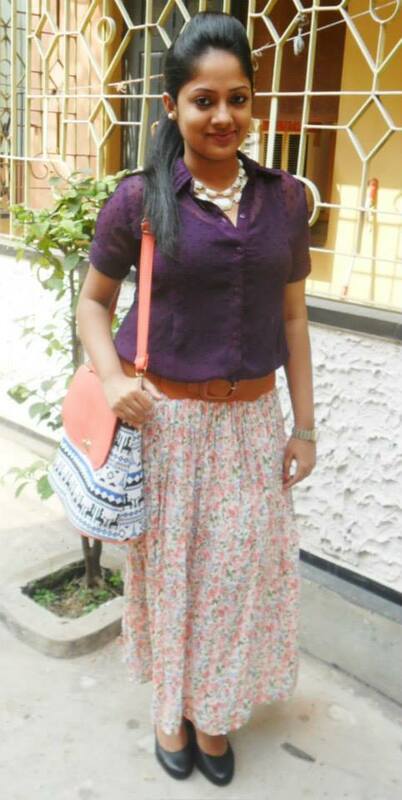 Ananya has a panache for storytelling and one can clearly see that in her blog. I like the way she engages the readers in her blog and brings in relatable fashion for us. Her fashion tips are very helpful and a pretty lady as she is I'm sure her readers find a smile on their face while reading her blog. You are wonderful! <3 Love how this post is full of colors!